Undeterred by pending lawsuits facing Alexei Navalny, the People’s Alliance chose the opposition leader as its party chairman and prepares to continue its political fight. The People’s Alliance elected its central figurehead Alexei Navalny as its chairman at the political party’s convention in Moscow on Nov. 17. Other key posts in the party went to members of the Foundation for the Fight Against Corruption, which was established by Navalny. The opposition leader, who ran and lost earlier this year in the race for Moscow mayor, is facing another a second round of charges filed by prosecutors last month, which accuse him of accuse him of laundering money from the Russian branch of cosmetics giant Yves Rocher. In September Navalny was giving a suspended sentence related to a case in which investigators accused him of embezzling funds from a Kirov timber firm. 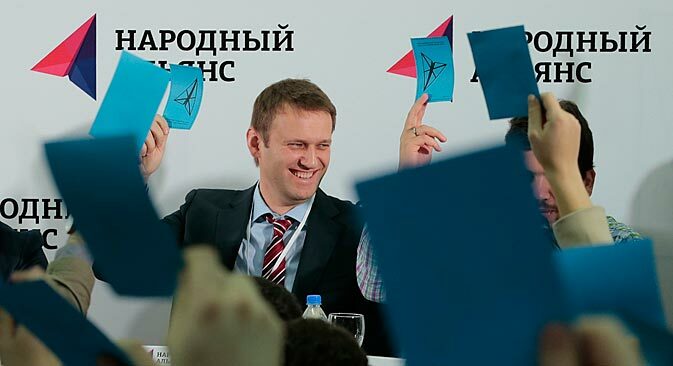 Despite the legal troubles, 88 out of 108 delegates at the People’s Alliance third congress voted for Navalny to become the party chairman. Sergei Ukhov, a member of the party from the Perm region and the opposition activist Nikolai Lyaskin competed alongside Navalny for the position. Lyaskin received 12 votes and Ukhov received 6. ITAR-TASS reported that one of the delegates voted “against everyone,” and one ballot was damaged. Officials in previous rejections said that the members of the party failed to provide the minutes of the general meetings for the nomination of delegates to the second convention or such documents as would confirm the establishment of a regional office in Kemerovo Oblast. After the election, Navalny thanked those of his associates who had supported him. “I am grateful to all for the support and will do everything to fulfill your expectations. I am confident that our party will be registered and receive the backing of the voters,” he said. In the near future, the party lawyer, Vladimir Ashurkov, will submit the required documents for the People’s Alliance’s registration with the Ministry of Justice. Alliance party members hope that their party will be able to participate fully in the elections to the Moscow City Duma in 2014 by putting forward its own candidates. The party also suggests that its leader will take part in the next presidential elections. Experts, however, do not share the optimism of the opposition. “Power still belongs to the current elite, not to the new one that Navalny is trying to form. So, legally, he will not have the right to go for the presidential race unless the laws change,” Igor Bunin, the director of the Center for Political Technologies, told Nezavisimaya Gazeta. In fact, Igor Bunin is confident that Navalny is counting on a serious political crisis and expecting the support of the opposition. Additionally, he pointed out that the opposition has recently been changing its relationship to Navalny. Many had been critical of Navalny’s support to nationalists. Bunin thinks the opposition leader brings a new electoral value for the liberal opposition since he is likely to participate in the Moscow City Duma elections. “Of course they would like it if their leader were the writer Boris Akunin, who subscribes to the liberal system of values. But Akunin is in France writing books and not involving himself in politics. At the moment they are all placing their hopes on Navalny. Life forces them to disregard his nationalism and blindly follow after him,” he said. Based on materials from Gazeta.ru and Newsru.com.